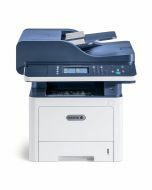 Save 10% on supplies with your WorkCentre 3335/3345 purchase (available at checkout). 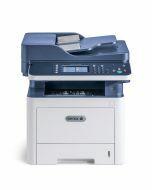 The space-saving WorkCentre 3335/3345 helps you conserve energy and reduce supplies costs by combining the functions of a copier, printer, color scanner and fax into one affordable device. With print speeds of up to 42 pages per minute, 1 GHz of processing power, and 1.5 GB of standard memory, you’ll get your prints faster and spend less time waiting. 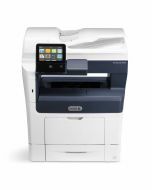 Thanks to standard internal Wi-Fi, you can put your WorkCentre 3335/3345 where you need it and print from nearly anywhere. Our Wi-Fi installation wizard and Wi-Fi Print Setup (WPS) make getting connected secure and simple. And, with Wi-Fi Direct®, mobile devices can connect directly and securely. The WorkCentre 3335/3345 takes walkup simplicity to a new level, with a larger 4.3-inch color touchscreen interface. Scan to email, or scan-to and print-from from a USB memory drive right at the device. You can even print directly from the cloud with a few simple steps. Product Size Dimensions (WxDxH): 3335 - 16.3" x 16.6" x 17.7" ; Weight: 34.19 lbs. | 3345: - 18.5" x 17.5" x 19" ; Weight: 38.07 lbs.